Given the demands of the modern business world, you need to have an email service that allows you to access messages, contacts, appointments, and tasks on nearly any mobile device. Microsoft Hosted Exchange and Office365 allows you to do just that without the difficulties and inefficiencies of other email systems. Set up an account today with us, it’s easy. Our service covers the most basic’s of needs to the most complex systems. Take a look at our competitive prices and get in touch with us! What is a Hosted Exchange Email? As a business leader, you know that email is a vital component of doing business in the modern digital world. When you work with a Microsoft Hosted Exchange, you have access to all the benefits of Microsoft, but without having to worry about running the system yourself. For just a small monthly fee, we host the email for you, so you receive all the benefits and none of the drawbacks. This means we take care of all the setup, regular upgrades, and troubleshooting. Most companies and their employees are already accustomed to using the Microsoft Exchange email system, as it is one of the most widely used email systems. By working with a Microsoft Hosted Exchange, companies will not have to worry about learning an entirely new system. The enterprise MS Exchange is an affordable way to get all these benefits on a convenient, pay-as-you-go system. Why do I need a Hosted Exchange Email? 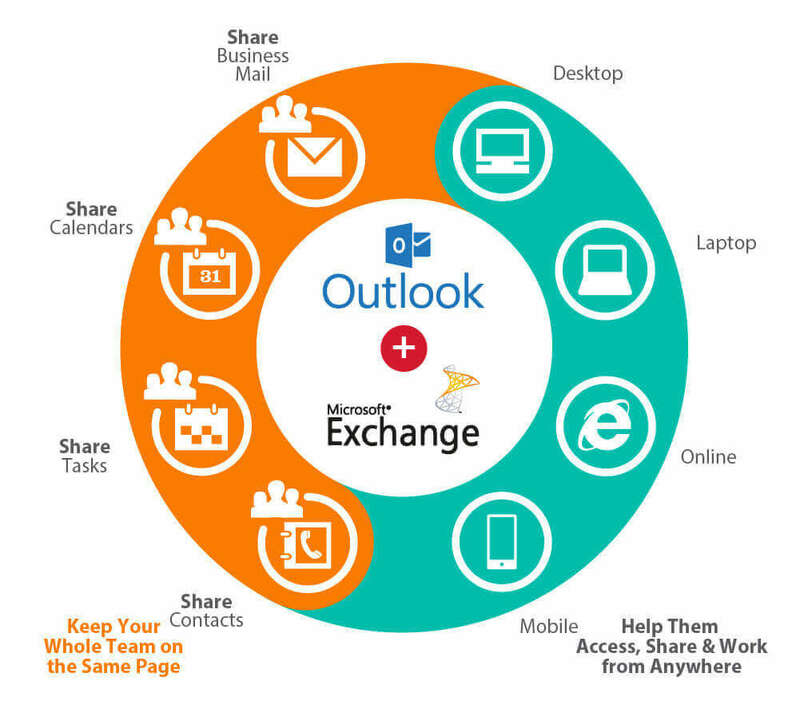 Compared to other email options, like POP3 or IMAP, MS exchange email offers you the most benefits. You can have your email available from any device at any time. Even the calendar and contacts can sync between devices. You also have the option of saving emails in a cached mode to work offline should you choose. With Microsoft Hosted Exchange, you have access to the easy to use, popular interfaces that have made Microsoft so successful. Whether you are looking to receive the latest version of Outlook for PC or Entourage for Mac, we make sure you have access to the latest technology. It is easy to synchronize your email between devices, so you do not have to worry about missing the important business news. Whether it is auto-reply, personal and shared email address books, task manager, mobile synchronization, or spam filtering, our hosted exchange email services help you stay in front of the competition. You will also have access to support and troubleshooting assistance whenever you need it. Just give us a quick call, and we will promptly respond. There is no need to worry about employing special IT teams or wasting company resources or time — we are your support team. How Secure is Hosted Exchange Email? IGV’s Secure Hosted Exchange service allows businesses to enjoy worry-free email, mobile device synchronization and all of the other benefits of Microsoft Exchange without the expense and headaches of managing in-house mail servers. WHY SHOULD I CHOOSE IGV? We have over ten years of experience in supporting a variety of MS products, including hosted email exchange. We bring you the experience and Microsoft expertise you are looking for to keep your business moving forward. Competition is fierce in your industry, so you do not want to waste time and energy trying to implement your own system. For an affordable monthly fee, we offer you the chance to have all the features of an exchange email system without any of the hassles associated with it. Our friendly and helpful staff is here to understand your email needs and get you set up and running today. Like to receive a FREE quote? Please fill out the form below and we will get back to you, as soon as possible.